It may have taken quite a long time to materialize, but the new BlackBerry 10 platform is already here – loaded with new, contemporary features and with 70,000 apps in its arsenal, headed on its way to the pockets of interested buyers. Would you like to get more familiar with it? If so, then you've come to the right place. This walkthrough post is about the essential features in BlackBerry 10 and their implementation within the platform. These are the things that make the new BlackBerry 10 OS new – detached from the outdated BB7 and now worthy of challenging the well-established competition. You'll get to see how its makers have taken advantage of all that touch screen real estate and built their platform around simple gestures. Also, you'll get an idea as to what apps BlackBerry 10 will have to offer at launch, and whether your favorites are in its catalog. So without further ado, feel free to flick through our BlackBerry 10 walkthrough and check the platform out. Who knows, this might be the alternative mobile OS you've been wanting to use all along. The minimalist, yet functional lock screen is what appears upon pressing the on/off key on a BlackBerry 10 handset. It hosts all standard status icons, such as battery level and signal strength, on a strip at its very top, while the time and date are displayed underneath. The button located in the bottom right-hand corner is used for instantly launching the camera app, and the notification icons on the left inform the user in case they have any new messages. If music is playing in the background, pressing the volume rocker brings forth a music player widget with basic controls and a volume slider. An upward swipe unlocks the BlackBerry 10 smartphone and takes the user to the home screen, which is where all available apps are listed in a very iOS-like fashion. As far as customization is concerned, the wallpaper can be changed and the icons can be rearranged or organized in folders, but that's pretty much it. Swiping up from the bottom of the screen while in any app takes the user to the so-called Frame view, which is the way multitasking is implemented in BlackBerry 10. All opened applications are listed there and can be switched to with a single tap. Swiping down from the top edge of the screen displays a list of toggle buttons for various features, such as Wi-Fi, Bluetooth, and automatic screen rotation. That's also where shortcuts to the alarm clock and settings menu are placed for convenience. In BlackBerry 10, all of the user's conversations – from email, text messages and BBM to Facebook and Twitter feeds and notifications, are packed together in the BlackBerry Hub for quick access and easy management. Again, accessing the BlackBerry Hub is done with a gesture – a swipe up and then right from the home screen. Speaking of conversations, here's the BlackBerry 10 virtual keyboard as seen on the BlackBerry Z10. Naturally, BB10 handsets with a physical keyboard, such as the BlackBerry Q10, won't have it. As all of its modern counterparts, the BlackBerry 10 keyboard comes with word prediction. Selecting the next word, assuming it has been predicted correctly, is done by swiping up from the respective on-screen button. In BlackBerry 10, BBM has been thoroughly overhauled and blessed with new features. Users can now make voice calls with video in addition to exchanging simple text messages. The new screen share feature does what the name implies – when enabled, the user streams video to the other party showing whatever is on their screen. If you've ever used a smartphone's built-in calendar, you should be feeling right at home with BlackBerry 10. The platform's organizer application stores your appointments and can sync with Google Calendar. And that's the BlackBerry 10 Clock application. It tells the time and wakes you up in the morning – simple as that. There's a few handy extras, however, namely the stopwatch and the timer. You can't really have a full-featured mobile platform without a calculator, can you? Well, BlackBerry 10 has one with built-in scientific mode, unit converter, and tips calculator. In addition, BlackBerry has thrown in a compass and a file manager. BlackBerry 10 comes with a very speedy web browser that can rival its modern counterparts thanks to its fluidity and performance. It has all basic necessities covered, such as support for multiple tabs and the ability to download web pages for offline use. The camera interface in BlackBerry 10 is complemented with a rich array of photo editing features, such as filters and various enhancements. Another cool camera feature that BlackBerry 10 brags with is called Time Shift. Basically, it takes multiple consecutive photos even when the user hasn't yet pressed the shutter. In case someone blinks, their face can be replaced with a crop from an image that the interface has captured previously. The BlackBerry 10 music player may be pretty standard in terms of appearance, but it definitely gets the job done. Its main screen displays album art and the basic music controls, while the user's audio collection can be organized by artist, album name, or genre. 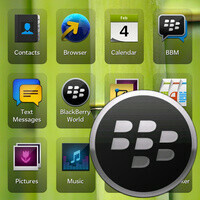 BlackBerry 10 is well capable of playing back most popular video file formats, including videos in HD resolution. As any other modern smartphone platform, BlackBerry 10 offers a Maps application with 2-dimensional maps. The app can give voice-guided, turn-by-turn directions, which is great news for anyone who drives frequently. Many popular games have been made available on BlackBerry 10, including Angry Birds Star Wars, Radiant Defense, The Bard's Tale, and World of Goo. Many more great titles are also bound to land on BlackBerry 10 in the near future. With over 70,000 BlackBerry 10 apps at launch, BlackBerry World is where you get new games and software for your BlackBerry 10 smartphone. In addition to applications, the storefront has a broad selection of music, movies and TV shows in its catalog. Although I think android looks better, I prefer it to ios. Better Copy of Meego..! In every way they have coppied Meego. with some additions. shame nokia didnt continue with it two years back,,,! So true, Meego is ahead of BB10 I would even say. Its gestures are way more complicated than MeeGo. It looks pretty good actually. I might trade in my WP8 for one once this phone drops to $350 or so. BB10 is gonna surprise ppl. We might wind up with an almost even 4 way split with marketshare. If that happens.....I wouldnt be surprised. Seeing all these other OS's trying to catch up really makes me realize how far ahead android is. I want to try a new OS but it just seems like it would be such downgrade. ok the video calling is clearly a rip-off of facetime which has been around for ages....god why is everyone copying apple/iphone? !